We offer current and cutting edge private practice marketing training and group practice marketing training for health and mental health practitioners to help you and your staff grow your practice. 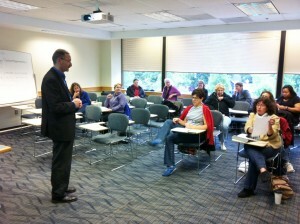 Wayne Kessler, Private Practice Helper Founder is a sought after, engaging, dynamic, and humorous speaker and trainer. Wayne has done many presentations with small and large groups, both in person, and virtually on current practice building topics of interest to clinicians. Wayne has also created a Mastermind Program that engages webinar participants to learn about the details of these topics in a virtual or in-person setting. Contact Wayne to learn more about training.